If one year equals 7 dog years; Me and Cosmo embarked on our middle age together, and I looked to him for inspiration for a new body of work! Me and Cosmo walked together every day rain or shine. And over the years we got to know local woodlands and sections of the coast line very well. This daily routine provided the opportunity for me to create art about where I live and the landscape we walked together. This was always my plan, but somehow I was never able to achieve it, but dog walking provided the solution. So we entered middle age together and a new era in our lives. I hope this blog will mark the return to ‘Painting’….. another one of those unrealised plans. 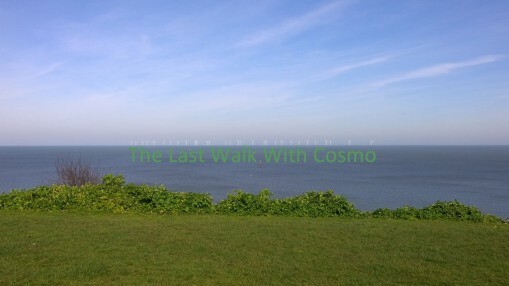 So the time and the circumstances came together for ‘Another Walk With Cosmo’. ‘3 years’ since Cosmo died. I am still not a dog owner after all this time. I nearly fostered a dog but at the 11th hour I pulled out. 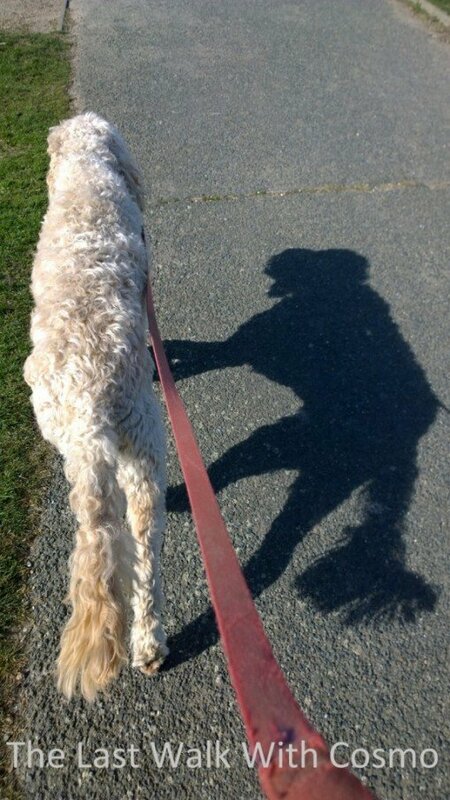 I have not walked regularly without the dog in the ways I had hoped. Though I have ridden my mtb through the woods frequently this winter. To appreciate things for maximum benefit walking is the right pace, a bike is fun slip slidy in the mud but you are always looking just ahead in order to follow the path. Unlike walking where you can look all around a really hear and see what’s going on. I am closer to buying another dog as ever I have been and I think it would inform my practice as it did before. So, now two years have passed and I don’t have another dog. I think I will get one but not at the moment. My life has lost the structure that it used to have, which in some ways is good, its nice to have flexibility. 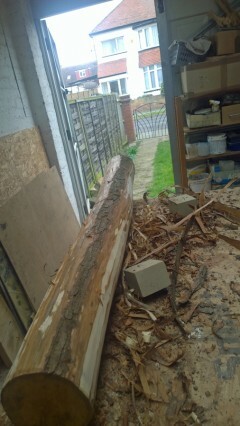 On the other hand having the structure was good it made me achieve things. I had completely lost the habit of walking and as result don’t see the changes going on around me. 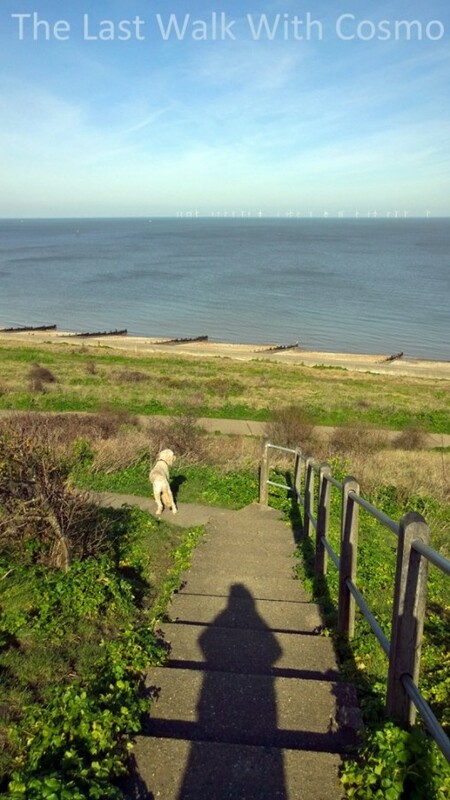 Having the dog empowered my walks took me to places gave them purpose. I was never intimidated by any kind of boundary or situation. Now if I do walk its timid keeping to pathways and within limits. I obey signs and I keep out…..these are bad things. Its way more interesting to break out, have a look and find out. I was liberated with the dog! 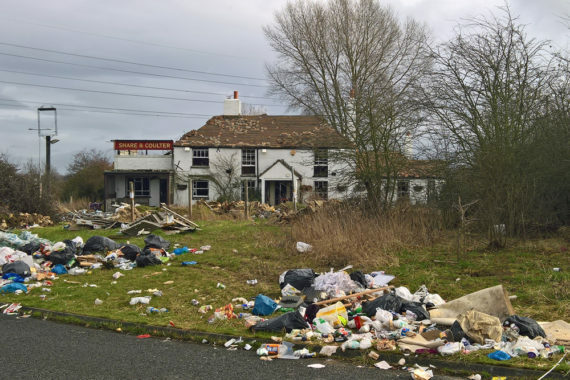 As the spring has started I found myself walking a little and discovered the area around the Share and Coulter which had been fly tipped to such a degree that I thought it would make the regional news after the 6.pm national news. The amount of rubbish was astonishing but because I never went there I cant describe it really. I did take a photo once, passing in the car as I was so shocked. 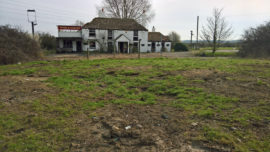 It has been like this for a year or so and is typical of the Edgelands Paul Farley and Michael Symmons describe in their book. This is what happens in the wilderness? Anyway because I walked past I know the council must have cleared it up! 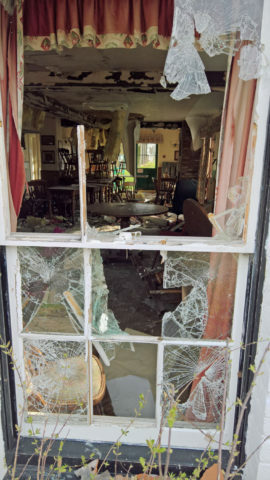 I even looked inside the window ….shocking. This pub was a going concern when it closed and I expected it to just change hands. But it is a ruin now. 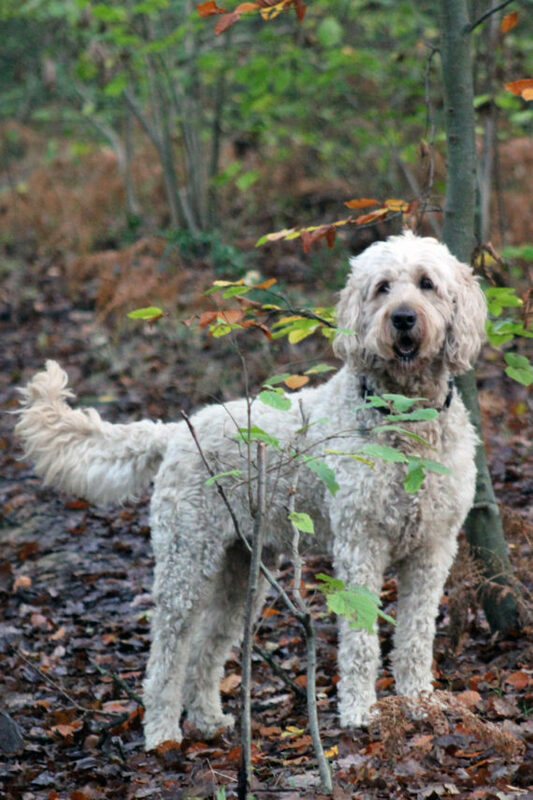 It is exactly a year now since Cosmo died and I have not got another dog. The commitment to dog ownership is massive and I have not had a knee jerk reaction into replacing the hole left by his passing, as the commitment is considerable. This responsibility and commitment is a double edged sword, because that responsibility is what I am relieved of, yet that is what made the relationship between us so worthwhile. An emotional investment I loved, yet not willing to embark on so soon, or even maybe ever in the future. Cosmo was not just a pet. Though I can’t say he was a working dog, in the sense of a guide or hearing dog, my independence has not been diminished since he went. He was what might be described as a co-worker and I am not ashamed to say how much it cut me up when went. I think some people say what’s the feckin deal, a dog move on. I enjoy talking to people who own or had dogs and I take solace from their stories. Grief is cyclical and comes in waves and I am still unable to walk along the local coast line or in the woodlands without considerable pangs of grief and melancholy one year on. The places, the paths, the trees, the seasons, the birds all triggers to some kind of sense of loss. Perhaps a testament to how Cosmo connected me to the natural world for which I am truly grateful. I am proud of the tribute I created to him in the woodlands. A spot I visit sometimes where the crows, the ponies, the trees, the flowers and the deer all merge together into a place of equality. A place where I am embarrassed and apologise for how we treat the planet, as if it was there only for our benifit. Sharing….. a concept not on board. 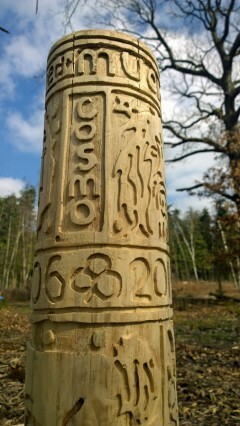 A couple of days ago I installed Cosmo’s Post in the woods. 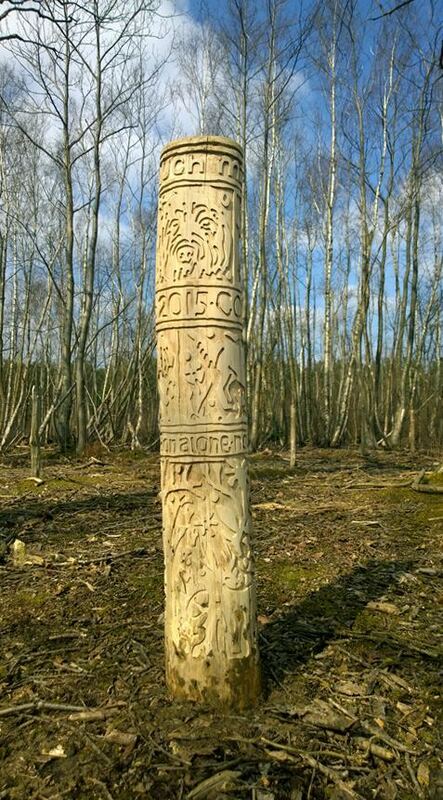 I got permission from the owners of the woodlands, who were very understanding and allowed me to make the tribute. I made it from the trunk of a chestnut tree from the woods. We spent a lot of time in these woods, and while I was artist in residence there he came to work with me every day. We spent many whole days in there. 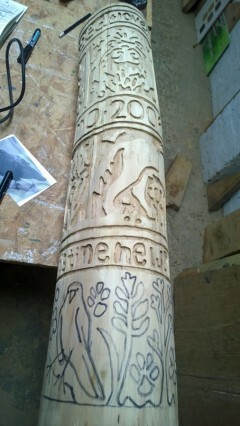 So, my post did have the three horses on, it has wild flowers, a deer, crows and oak trees. 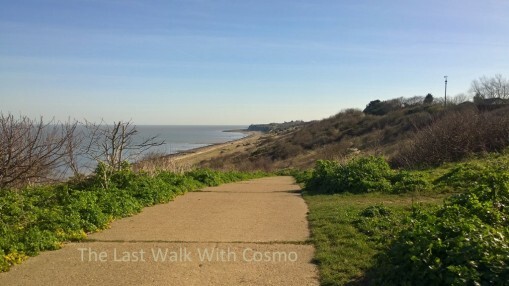 Several images of Cosmo and his foot prints plus a little bit of text. 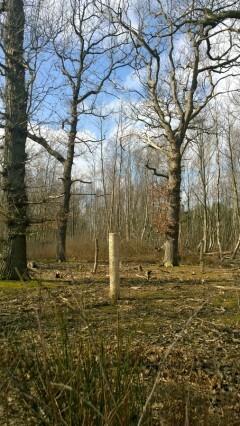 It’s a nice part of the woods and one of the remotest. The wild boar are gone and they have been replaced with about a dozen deer. Lots of crows, I think there must be a rookery there. A mainly visual tribute to my companion Cosmo on his final walk. 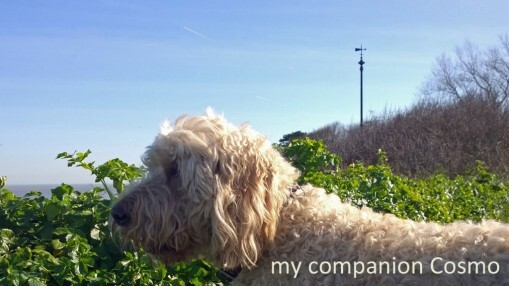 My work mate, my shadow, my muse and my friend. A big miscalculation, I don’t think the formula of 1-7 years works in relation to dog and human life spans. The vet told me he was dying at an average age for a dog his size. He so enjoyed his walks, he was walking 20 minutes before the end. Walking was preferable to standing, sitting and laying down, right till the very, very end. I walked on the shoulders of a Giant.